Alan Watts in 1982 on the East Face of Monkey Face, Smith Rock, USA. 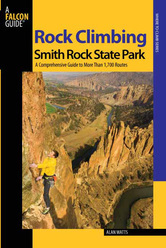 Rock Climbing Smith Rock State Park, 2nd: A Comprehensive Guide to More Than 1,800 Routes (Regional Rock Climbing Series) - Alan Watts. Interview with Alan Watts, the climber who played a leading role during the 1980's in developing Smith Rock into one of the most famous crags in the USA and the world. In the mid-eighties there was one crag on everyone's lips: Smith Rock, Oregon, U.S.A. Lycra-clad climbers from all over the world flocked to the State Park for the sunshine dihedrals and smooth rock faces, developed in large part by young Alan Watts, a leading figure in the American climbing scene at the time. Watts first arrived at the Park in 1975 and, hooked from the outset, focused the next decade exploring the personal limits of his own climbing and, contemporaneously, creating lines for others which were to become the leading lights in this sport. In this exclusive interview the man responsible for some of the finest and most famous early sport routes takes us back to the days of hand-drilling, rap bolting and hang-dogging, providing insight into the crag's heyday and explaining how the sport climbing movement in the US evolved into what it is today. First question Alan: for me Smith Rock is always intrinsically linked to Alan Watts. How true would you say this is? I’ve never thought about it like that. In a general context, it really isn’t true at all. People were climbing at Smith Rock for decades before I ever started climbing, and there were a couple hundred routes (up to 5.11) before I did my first Smith route. I climbed at Smith extensively from 1975 until the early 1990s, and it’s hard to argue that I wasn’t influential during those years. But another decade has passed where I haven’t done much of anything. The hardest routes at Smith were redpointed by others, not me. Like any other Smith climber, I came, made my mark, and moved on. The fact that you even thought to ask the question makes me wonder why it might seem this way. I think that the development of Smith Rock would have unfolded in a dramatically different way if I hadn’t dedicated so much time to the place. The hardest grade at Smith Rock rose from 5.11b in 1979 to 5.14c just thirteen years later. I personally took it as far as 5.13d (though I repeated the existing 5.14a routes during the 1980s, I didn’t do the first free ascents). Almost no one climbed there when I devoted myself full-time to Smith climbing in 1980. I pretty much single-handedly got the sport climbing movement going and was the sole developer of 5.12 and 5.13 climbs through 1985. These routes brought climbers from around the world to Smith. Had I not done what I did, J.B. Tribout never would have visited, and To Bolt or Not Be, and Just Do It, for instance wouldn’t have been done when they were (and maybe still wouldn’t be done). Can you explain how Smith Rock developed into a world famous crag? When I got into climbing at Smith Rock, it wasn’t unlike any other local, unknown crag anywhere in the US. Almost every route was traditional and the few bolts on face climbs were almost all placed on lead. With the 1979 standards at 5.11b (at the same time Tony Yaniro did Grand Illusion) Smith was a long way below the highest level of the day. When I went to college at the University of Oregon in 1978, along with my high school friend Bill Ramsey, I met Chris Jones (the American boulderer) and Alan Lester. The four of us developed a friendly rivalry and we pushed each other. There’s a small top-rope crag right in downtown Eugene, Oregon and we did every imaginable variation. Chris Jones was a phenomenal bouldering talent, and trying to keep up with him was almost impossible. But we all got pretty good in the process. Chris and Bill did the first free ascent of Monkey Face in 1979, which was essentially a sport route (with some bolts placed on rappel and others on lead). By the time I quit college in 1980, the hardest route was Jones’ Rising Expectations (5.11d). It didn’t take long to repeat the 10 or so 5.11s at Smith, so soon I started looking at doing free ascents of aid routes. These dominated my efforts the early years, and most of these were traditional routes. Within a couple years, the only remaining aid routes were beyond my level, so I started looking at the blank-looking faces. It wasn’t until I started rappelling unclimbed faces at Smith did I realise how featured they were. But many of these routes couldn’t be done on lead without just drilling a bolt ladder. So I started rappelling routes, and hand-drilled bolts. The first of these that I succeeded on was Watts Tots, though this route had a fixed pin and nut placement. It’s widely considered to be the first sport route in America, though I think Chain Reaction (done two weeks later) was the real beginning. Once Chain Reaction was done, it was clear that there were many other classic routes that would also go free and I spent two years bolting and climbing constantly. I was bouldering a lot, training, and climbing literally every day for months at a time. I got pretty good (at least by standards back then) so I kept doing harder and harder routes at Smith. The scene was entirely local. Chris Grover, Brooke Sandahl, Kent Benesch, myself and other locals were climbing at Smith constantly and we fed off of each other’s energy. It was great fun, keeping the secret about how great Smith climbing was. This changed dramatically in the mid-eighties. Prior to 1985, literally no one ever visited from outside the Pacific Northwest. That year though Jonny Woodward, Kim Carrigan, and Geoff Weigand visited Smith. They were the first international visitors and it was great watching them repeat so many routes. They really validated what I was doing. Later that summer, after hearing reports from Woodward, Carrigan, and Weigand, Austrian photographer Heinz Zak visited Smith to take photos. He spent a couple days taking shots of me on Smith’s early classics. A few months later, these photos appeared in international climbing magazines. In 1986, foreign climbers started arriving, including Jean-Baptiste Tribout. By 1987, Smith was on the international map, and the local scene was never the same. Once the word got out, the scene shifted entirely and almost instantly. Within a couple years, it seemed that every well-known climber from around the world had visited. It was exciting to see how many other climbers started to do first ascents, and the level just exploded. Everyone was working very hard, and as it became obvious that Smith stood atop US climbing standards, it was exciting to be a part of. For a few years, it was simply THE place to climb in the US. Newer sport crags hadn’t been developed and the traditional areas (Yosemite, Eldorado, and The Gunks) seemed hopelessly traditional. Having the climbing world flock to crag that I grew up with was pretty amazing. From all points of view? Outside of Smith Rock, there were a lot of negative feelings. At first, no one noticed when I visited places like Yosemite and repeated hard routes. But once I started doing routes that hadn’t been done by locals, I received much undesired attention (along with other rebels, like Todd Skinner and Christian Griffith). At the time, I was a very accomplished crack climber – obviously as good as anyone back then. I was also adept at placing gear and after climbing on the soft rock at Smith, small wires in granite seemed bombproof. I did routes like the Yosemite’s Stigma in very good style, in two days, placing all nuts on lead (this was before a couple bolts were added). And the local climbers ripped me apart for it. A lot of my climbing heroes (Ron Kauk, John Bachar, and others) were very much against my style (hangdogging, in particular, before a redpoint ascent). It got to where it wasn’t fun to travel to Yosemite anymore, for fear of getting in fights and getting my car vandalized. And with so much going on at Smith, there was little reason to leave home. So how much did invest in your climbing during those years? In the early years of my Smith career, climbing was pretty much the only thing in my life. It was more than just an activity for me - it was literally my religion. All of my social connections were people I knew from climbing. In my own mind, I pretty much didn't exist outside of climbing, but at the time, that was a good thing. I think that if I hadn't had that focus, I wouldn't have done so many routes during the formative years of Smith sport climbing. When I started climbing bolts weren't taken for granted at all. The only bolted routes in the US had the bolts placed on lead and always with a hand drill. Some of these were exceptionally bold, but without exception they weren’t very difficult, from a purely technical standpoint. The hardest routes that featured bolts were freed aid climbs – the bolts were left over from the first aid ascent years before. Smith Rock became a radical departure. Bolting on rappel was considered by most climbers to be an unpardonable sin. The opinion of the old school was that the means used at Smith Rock did not justify the end. Personally, I felt that the nature of the rock at Smith justified these tactics. Until 1987, every single route at Smith was drilled by hand. This was an unbelievable amount of work, and limited the development. The discussions weren't all about bolts though. Curiously, the biggest complaint in the 1980s from the traditional climbers wasn’t the rap bolting. Instead, it was hangdogging. It seems really hard to believe now, but the act of working out a sequence after hanging on a rope, was very controversial back then. Traditional climbers felt that using this tactic invalidated the eventual redpoint lead. When sport crags started springing up everywhere around the US in the 1990s, soon enough there wasn’t a debate anymore. By the time kids like Chris Sharma showed up, they had no way of knowing how much controversy and rebellion went into the bolted routes found everywhere around the United States today. Some of the most famous routes were cleaned and bolted by you, but not freed. An unselfish act in a self-centered game? Well, yes and no. I had many routes going at the same time in the early days, and I got the idea that just about anything was possible. So when I spent days in 1984 cleaning and top-roping what became To Bolt or Not to Be, I wasn’t being unselfish. I seriously saw myself doing it (though I wouldn’t succeed until 1989). This changed with other routes. I cleaned and bolted Just Do It in 1989, and at the time I realised it was very unlikely I would every succeeded. I was suffering from worsening finger joint problems and my days pushing the standards at Smith were numbered. But at the time, I didn’t think anyone was better at spotting and preparing new lines. I took a lot of pride in the fact that Smith standards were so high, and I had an interest in preparing routes to continue the momentum. So by the end, it very much became and unselfish, artistic process. How do you view this momentum now? More than anything else, this is what separates the old days at Smith (the 1980s) from current times. Almost everything hard done in the past two decades is the product of the unfinished routes from my generation. The artistic, creative process of original new lines seems completely forgotten. But is there still scope for more? Yes. I didn't stop developing Smith Rock because I ran out of new route options. Instead, I pretty much destroyed my fingers doing too many pin scar cracks and climbing for months at a time with never taking a rest day. I had a very long list of high level new lines that I wanted to prepare when I quit. There were a couple dozen routes I had scoped out and these would have all been 5.13 and 5.14. For instance, there are two unprepared 5.14+ to 5.15- routes on either side of Just Do It. It's a lot of work preparing routes at Smith because the rock isn't always naturally good. It would take days of work getting a route clean enough to climb. I was more than happy to put in this work, and I enjoyed the process of preparing routes almost as much as climbing them. But as it turned out, no one else shared my interest. There were so many existing hard routes, and so many unfinished projects when I quit, it kept climbers busy for a couple decades. The higher-level new lines are still there, untouched, but I'd be very surprised if someone came along who wanted to invest the time and energy. Never say never! What springs to mind with the term "visiting climbers"
When I think of “visiting climbers” I think back to 1986, especially when Tribout and Jean Marc Troussier showed up. Although Woodward, Carrigan and Weigand visited the prior year, they had simply repeated existing routes. Tribout and Troussier were the first “visiting climbers” to make a big contribution to the development of Smith Rock. And then almost overnight, it seemed like just everyone showed up. Many of these visitors (including Scott Franklin and Jim Karn) just moved here and became locals.It was the visiting climbers that really took Smith Rock so far. I kind of just set the stage for what others would do in the future. Who and what impressed you most? It’s impossible to pick just one climber. Obviously, J.B. Tribout impressed me greatly when he arrived in 1986. His endurance and work ethic were far beyond any American climber at the time. I think there were more naturally talented climbers at the time in the world (Edlinger, Glowacz, and Rabotou, for example) but very few worked as hard as Tribout. The fact that he was willing to travel to the other side of the world, to visit my local crag, seemed remarkable to me back then. And his first ascent of To Bolt or Not to Be was so hard it kind of forced the critics of Smith Rock climbing to take notice. Another climber that struck me was Wolfgang Gullich, he impressed me for many reasons. He was incredibly strong, had a tremendous work ethic, and was just about the nicest guy in the world. He also epitomized what I imagined sport climbing could become. I wasn’t nearly good enough to take it that far, but he was. Of course, he came extremely close to establishing the world’s first 5.15 (Action Directe 5.14d) way back in 1991. I’m sure it’s difficult for today’s climbers to realise what a radical advancement that was (given that Punks in the Gym, the first 5.14a, was freed by Gullich in 1985).In six years, the standards increased a full number grade. This may never happen again. In later years, I wasn’t involved as much. But I very much remember Chris Sharma’s first visit in April 1997. At the time I had heard about this talented youngster, but wasn’t prepared for what I saw. My first impression was that he wasn’t exactly graceful and efficient in his climbing. I expected him to struggle on Smith’s technically demanding lines. But when I watched him repeat Just Do It, blowing sequences the whole way, I realised that climbing had moved onto a whole new level. It just wasn’t very hard for him. The East Face of Monkey Face was the hardest route at Smith Rock before the international scene arrived at Smith Rock. But it was really a throwback to the older days. It was mostly traditional, with jams almost the whole way. Placing gear was a HUGE part of the climb, and when people repeated it with pre-placed nuts, it just wasn’t the same. I never preplaced gear on the route and that’s why it took me so long to do it. I first climbed the route in two pitches (since that’s the way the original aid climb was done). The first pitch was 5.12c and I did it in 1983. The next year, after a whole lot of work, I freed the upper pitch, placing the gear the whole way. Since I had already done Grand Illusion, it was clear to me that the upper pitch was the hardest redpointed lead in the US. The next year I returned, doing the route in a single pitch, again without pre-placed gear. But, unfortunately, after placing every nut several times (and failing on the final bolted moves), I settled for a yo-yo ascent the day before leaving for Yosemite. In some ways it was a landmark climb, and in other ways it wasn’t. It was harder than the hardest US routes at the time, like Grand Illusion and Sphinx Crack. But with the shift to sport climbing, it wasn’t nearly as influential as the bolted routes. In 2004 Sonnie Trotter from Canada returned to the route and climbed it with trad gear only. Was this the missing link and what value does this have? And can you see other routes being climbed in this way? Sonnie’s ascent was great. What impressed me the most was that he actually realised the value of placing the gear on lead. That’s the only way I ever considered doing it, but I figured that no one else would ever see it this way again. I was surprised that a new generation youngster would go the extra effort to start up the route with a rack of gear instead of just a rack of quickdraws. I wasn’t sure what to think when I heard he hadn’t clipped the bolts. There’s a misconception that I placed the bolts on the East Face, prior to my free ascent. The reality is that I simply replaced the bolts that were originally placed on the first aid ascent back in 1964 (these bolts are very dangerous in Smith’s soft rock). I didn’t add a single bolt. It had never even occurred to me to chop these existing bolts and do the route just on nuts. I’m sure the climb, even back in 1985, could have been done with natural gear (given that there were only two critical bolts high on the route). Back then, we weren’t adverse to running it out on sketchy nuts – that was pretty much the norm in the pre-sport climbing days. But I soon understood that Sonnie’s avoiding the bolts wasn’t any negative reflection on my ascent. In an age where sport climbing dominates, it was refreshing to see someone finding a creative niche in the sport. Original thinkers always have been (and always will) be a rarity in our sport. Sonnie definitely qualifies. What happened to your climbing? Around 1985 my focus started to broaden. I moved back to Eugene for two years, climbing only sporadically until graduated from college in 1987. In 1988 I got married, and was a founding partner in Entre Prises USA. I again put a lot of effort into climbing that same year, and I did a couple early ascents of 5.14s. But at the same time I was having some serious problems with finger joints. By 1991, I literally couldn't climb anymore without sharp pain in my joints. I published the Smith guidebook in 1992, and left climbing behind. I hardly climb at all anymore. I visit the local climbing gym with my kids, but I'm so far from being in climbing shape it's hard for me to imagine seriously returning to the sport. Once my kids were born (1993 and 1997) they became the focus of my life. I left Entre Prises USA in 1997, and I returned to school to get my master's degree. My son, Ben, achieved a lot of success in snowboarding at a very young age and most of my time and money went into supporting his sport. He's now sixteen, and a pro snowboarder on the US Snowboard Team. I still travel with him some during the winter and I manage his business affairs. Presumably it would be wrong to think as Smith as only a single pitch sport crag? Yeah, this is totally wrong. The highest walls aren’t massive, but at 600 feet there are many excellent multi-pitch routes. Some of the long routes on Monkey Face are as good as four-pitch routes anywhere (Northwest Passage, the Backbone and Astro Monkey) come to mind. And I think many people don’t realise that long before sport climbing, Smith was a traditional crack climbing area. There are still more traditional climbs than sport climbs. Last question: what routes must a visiting climber climb? Anyone coming to Smith should do some of the early sport climbs, just to sample the early beginnings of US sport climbing. But there are also some amazing traditional routes, on different rock types (basalt and welded tuff). And then there are the long routes. Anyone coming to Smith who just does one pitch free routes in the Aggro Gully is really missing something!